Combining Real Touch and real ball physics, passing is an art form in PES 2017. Many factors determine the speed and accuracy of the ball. The pass that is made on the best situation and timing will generate a perfect trajectory, creating a great satisfaction when a killer pass is made. Keepers see a great jump in quality through added motions and animations, creating the most agile keepers in PES history. Attacking moments will be more dramatic than ever, bringing the best feeling of achievement when that goal is scored. Users can instantly change the attacking and defending mentality of the team, which can be tweaked and carefully controlled with simple controls, being able to immediately react to the unpredictability of the sport. Strategies that are quite individually defined such as Tiki-taka and Tight Marking which is strongly based on team ideology can be set in Advanced Instructions, which adds a huge variety in how you plan to win. Control the defensive strategies on a set piece, such as marking zonal or Man to Man. Offensive options also included such as specific player movement. For the first time in a football game, the AI will learn how you play! 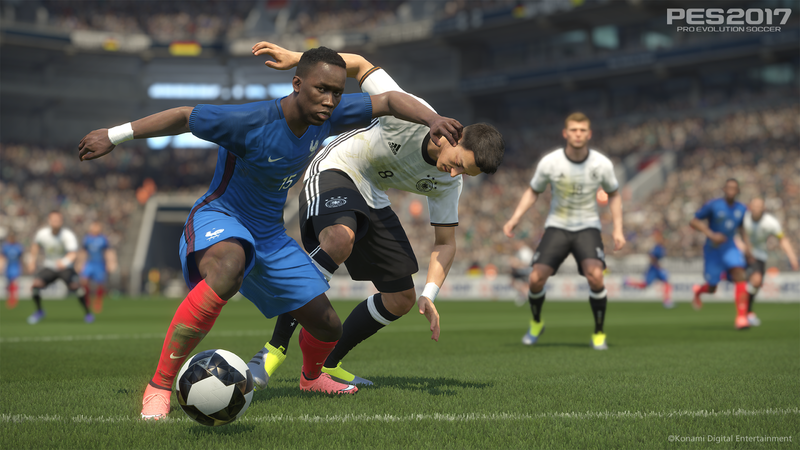 Player and team behaviour has always been a staple of the PES series, and for PES 2017 Adaptive AI will change sports games forever. 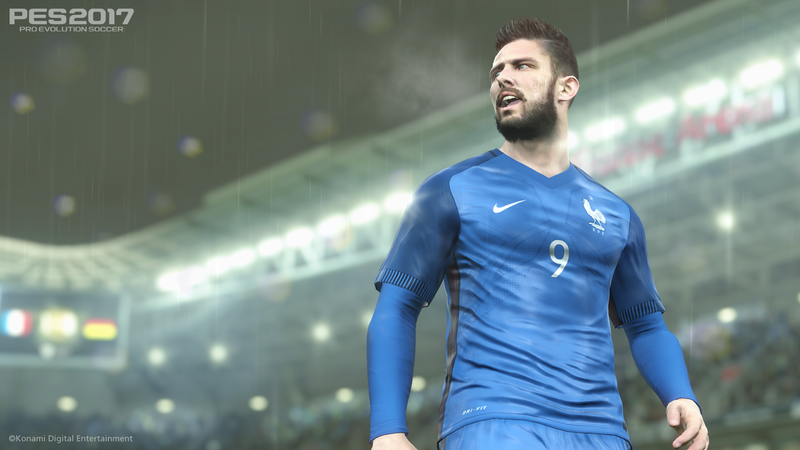 For PES 2017 the visuals have seen a major upgrade, offering Authentic Visuals thanks to the further incorporation of Fox Engine. Nothing has been left untouched, from player models, lighting, crowds, pitch and stadiums totally revamped. Never has a game looked so real. 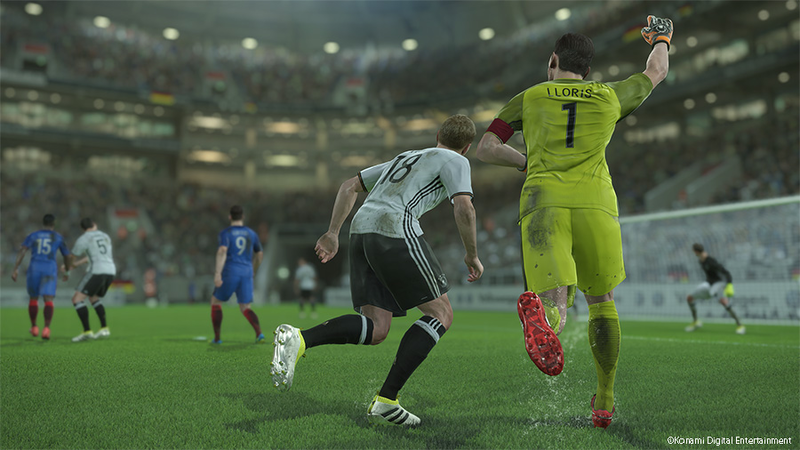 Hundreds of new animations have been added to bring the players and goalkeepers to life – but it doesn't stop there. New features such as Real Touch and Precise Pass see huge benefit, giving a vast array of movements when trapping and passing the ball. Last edited by Mike on Thu Nov 17, 2016 4:33 pm, edited 5 times in total. Sounds great but I think the game needs to have a smooth flow as in the movement and control seems rugged and slow. if they didnt have to adjust so much it would be better. Players dont seem to be able to out run defenders either. 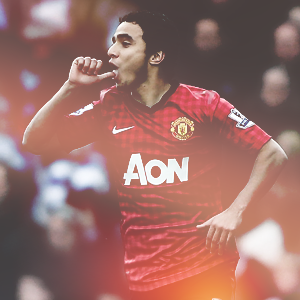 Hoping the goals take another step forward aswell. Keepers can make some great saves in this but next they are beaten with a shot straight at them. Im a huge fan of PES16, i still really enojying playing it so i really hope these new improvements add to the fun of the game. The Adaptive AI is interesting as someone pointed out its something they tried to introduce in 2008 and then 2013. AI that is meant to adapt to how you play during the game. I hope that this is done in line with the managers rating. for example, a bad manager may not adapt and you will continue to pummel them, but a world class manager will counter you well, or something along these lines. I Also hope that these are not just all gimmicks, i got quite excited about dynamic weather for this year thinking it will be a top addition to the game, but to be honest, i barely notice it if at all. nick7 wrote: Keepers can make some great saves in this but next they are beaten with a shot straight at them. I have enjoyed PES 2016 but I'm desperate to see significant improvements made for the new goalkeepers. And based on this tweet by Adam Bhatti, the early signs look good. Great to see referees mentioned too! Getting away from gameplay, right now I'm hoping we hear something about option file sharing, as well as being able to load Edit Data from PES 2016. DanWallyPESWorld wrote: ... but a world class manager will counter you well, or something along these lines. Imagine it, playing at home to Atletico Madrid in the Champions League semi-finals, you're absolutely smashing them in terms of shots and possession, but then Griezmann, Koke and co. steal the ball and end up going ahead after one of their typical counter attacks! I'm a sucker for PES hype, I'm not going to lie or hide it. All is sounding great so far! I expect a couple of these features to be "duds", as in you just won't notice them. Probably more than likely the "precise pass". 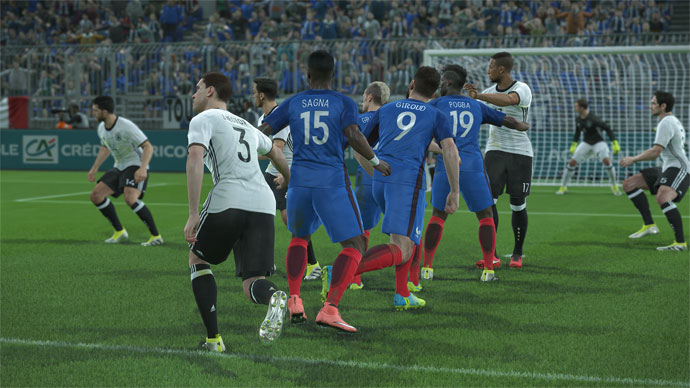 PES2016 was simplified a lot in terms of controls and difficultly. This feature just might be more contextual rather than skill. We shall see. I hope the adaptive AI also results in the AI making tactical subs, not just strategy. Would be great for the AI to throw on a different type of striker (Welbeck for Giroud as an example) and then change the style. Would also be great to see the AI try to exploit a weakness area in your team, say a dodgy full back. I'm excited and nervous about hearing the initial thoughts from the first gameplay this weekend. One important thing for me in PES2017 is the "assistance" being reduced. itll prob to way too early to expect this to be "finished" for the early play test. - Visuals upgraded but presentation not mentioned. This is where the game is falling behind FIFA year after year. We can have the most accurate stadium and player models, but if the camera can't track the ball on the painfully slow replays...what's the point? - We're in 2016 after 15 iterations of the game. I'm not so sure I'd be quite as proud to announce adaptive AI is only now introduced. Shales wrote: I expect a couple of these features to be "duds", as in you just won't notice them. I know what you mean. Dynamic Weather didn't really live up to expectation for me in PES 2016. Speaking of weather, I hope snow is finally added this year. If not full blown snow, then at least improved visuals for Winter matches. Right now, the players look great in their gloves, leg-warmers and neck-warmers, but it needs to be pushed further: muddy turf, snowy pitch-sides, and visible breathing. It would be great to see Player Styles (Offensive Full-back, Prolific Winger, Target Man, etc) have a bigger impact on things like AI substitutions and tactics: failing to break down a parked bus then conceding on the counter, wingers focussing on a reserve full back making their debut, resting aces for domestic cup matches, man-marking star players... the list goes on. Yesterday's announcement was only about key gameplay features. So don't fret, we should get more info regarding graphics, modes, presentation, visuals and (hopefully!) PS4/XB1 option file sharing over the next few weeks or so. Btw, great to see you back posting, itstroff. I hope you're well! Touching on Option Files, I'd expect this, if happening, to be announced during E3 or Gamescom as part of their usual press release. If it was real close last year (for PS4) then surely it has been figured for 2017...? That's it. These press releases are always going to hype up the game. But, at the end of the day, it's all about how quality the gameplay is when there's a controller in our hands. That's the dream! One day... but probably not PES 2017. Shales wrote: Touching on Option Files, I'd expect this, if happening, to be announced during E3 or Gamescom as part of their usual press release. If it was real close last year (for PS4) then surely it has been figured for 2017...? You'd like to think so! But with it being such a vital feature, I for one am not going to get my hopes up. The OF sharing slightly concerns me, if I were doing the press releases any solution to sharing OFs would have been put up first in big neon writing. Probably considered a bit techie to include alongside all the gameplay features. As an assisted passer the Precise Pass notes sound really good to me. I'm curious what full manual players make of it as it kind of sounds like timing and not the angle will be the most important factor. itstroff wrote: The OF sharing slightly concerns me, if I were doing the press releases any solution to sharing OFs would have been put up first in big neon writing. Probably considered a bit techie to include alongside all the gameplay features. I'm a manual player but I haven't really thought of that! To be honest, I could easily go back assisted if PES2017 has a true 1 bar assistance like 2015. 2016 was heavily assisted which kind of drove me to try manual. I since haven't looked back but I'll just have to see how it plays. PES2016 felt like it was built from Manual all the way up assisted 4 bar so hopefully you will still feel the precise passing in some way. itstroff wrote: if I were doing the press releases any solution to sharing OFs would have been put up first in big neon writing. If confirmation is going to come, that's exactly how I want to see it done! Not an expert on the ins and outs of the Xbox One, but assuming it's possible to implement, it'd be fantastic to see both PS4 and XB1 users get the same editing benefits (preferably something similar to what we had on PS3/X360). OF sharing is obviously the big one though. Even if you can't have 'proper' kits in there, at least with OF sharing there will be someone who will do the work for you. And, in a perfect world, this site will have its own PS4 option file. This is potentially huge for Arsenal fans and PES fans in general. Check out this pic from Asim's Twitter account. Doesn't take much to read between the lines on this one! Could Arsenal be replacing Man Utd, or is PES going to have 2 licensed teams again?? Or 3 or 4....? Looks like new face for Alexis, Ozil, Mertesacker and Monreal too. Shales wrote: Could Arsenal be replacing Man Utd, or is PES going to have 2 licensed teams again?? Or 3 or 4....? It's been a while since we had more than one licensed Premier League side, so I'd be pretty happy if we get two for PES 2017. In an ideal world, we'll see Arsenal, Man Utd, Emirates Stadium and Old Trafford. For me, Emirates Stadium would be a surprise and anything more than what I've said would just be ridiculous! Shales wrote: Looks like new face for Alexis, Ozil, Mertesacker and Monreal too. And for Atletico's Saul as well. More than deserved based on this season's Champions League!